The year was eleven-somethingty-something, and Duke Murchad of the Duchy of Munster sat on his throne — a throne probably made from wood lashed together with the entrails of the nearest ruminant — stroked his long, white beard and brooded. It had been five years since a successful campaign had reclaimed County Desmond into the Duchy that comprised the southern quarter of what would someday be known as Ireland, but the truce that had been struck had left the ruler of Desmond, Earl Muiredach, as a sullen vassal and now a threat to his peace. In his years on the throne ruling over his seat of power in County Thomond, and lording over the nearby County Ormond, which was ruled by a faithful but largely uninspiring vassal who seemed to take a perverse pleasure in his ornamental title of Cup Bearer, Duke Murchad had grown paranoid and ambitious. He envisioned his lineage ruling over all of Ireland someday, a great vision he knew he would never live to see, but that he hoped his eldest son, Brian, now 18 and married to a princess of England, could carry on after his death. But the years left to him were not long, and more than anything he wanted to leave a Duchy that was wholly reunited and cleansed of threats. More than any threat known to him, Duke Murchad looked south toward Desmond and the Earl Muiredach that had stood against him, and he plotted. It was not so simple as it should have been. The peace that had been signed between Munster and the rogue County Desmond to bring it into the fold had not been a total surrender. It would have been best if Murchad, who had led the forces of Thomond and Ormond south in what he hoped would be the last great campaign of his life, had simply been able to pull Muiredach out of some postern gate and thrown him into the darkest dungeon, but the craven Muiredach had eluded him, forcing a months-long siege. With Murchad’s support waning both in court and among his vassals as a result of the levies that kept his army together, he had allowed himself to be cowed into accepting peace terms that kept Muiredach as a vassal and ruler in Desmond. Things had been quiet since, but the longer he sat in the gloomy quiet of his hall, the more Duke Murchad rued his decision. Now he found himself growing old but still bound by terms that did not permit him to simply strip Muiredach of his title to replace him with Brian. He would have to find another way, and in his mind a plot formed. It was a relatively simple plan to fabricate some pretext for removing the title, delivering the ultimatum and perhaps allowing Muiredach to live his final days quietly as some unimportant member of court while Brian set the foundation for his rule from Desmond. But Duke Murchad knew he would need support to be positioned to act in the name of a united Munster, and that meant luring the Lord Mayor of Ormond into his plot. The Mayor of Ormond had been a content vassal and a loyal servant, but he had never been ambitious or particularly daring. For the first time in decades, this trait proved problematic for the duke, who had always prized the stability and comfortable relationship he had developed with the pliable mayor. The Lord Mayor thought highly of his liege, Muchad knew, but he was loathe to be a part of some devious plot by his very nature. A gift of coin was well received, and the Mayor of Ormond pledged his ongoing devotion to his liege, but still held fast in his decision to respect the peace that had settled over the kingdom, and the duke turned to the one option he had left. He knew that Ormond had longed ever since he first came to court to be Chancellor and act as the center of diplomacy in Munster, but he also knew that passive and pliable as he was, the Lord Mayor was ill-equipped to operate in such capacity, particularly considering the fine service his current Chancellor provided. And so, the duke had to make a choice: Risk the possibility of a future revolt from the treacherous Muiredach when the realm was weak and vulnerable as his son took up the crown, or put an honest but under-qualified man in the role of chancellor. It was June when the duke named the new chancellor, with the quiet understanding that he did so on the condition that the Lord Mayor of Ormond would support the removal of Muiredach. By July the message had been sent to the Earl of Desmond that he must relinquish his title and claims, and serve in court. The duke, confident that his untrustworthy vassal was at least not stupid enough to stand against a united Munster and the forces it could bring to bear, waited a fortnight for the reply. When he received it, he was not pleased. Muiredach, revealing himself as a traitor and faithless, not only refused to relinquish his title, but was now in open revolt, choosing to shatter the peace that had been agreed upon rather than bowing to lawful expectations of his liege. Duke Murchad had no choice, he raised his army of some 1,300 soldiers, gathered them together, and marched south to bring Desmond and its villainous ruler to its knees, this time with no quarter to be given. Muiredach’s forces of 800 met the duke in the field, and a fierce battle raged to its inevitable conclusion. Though now reduced to 900 men, the duke’s force prevailed, and Muiredach retreated north into Ormond with 300 remaining troops. The duke’s forces split, 400 staying behind to begin the siege of Desmond, while the remaining 450 led by the duke pursued the retreating army, hoping to finally crush them. And for the next month they pursued them across wide swaths of Southern Ireland, winning several victories that finally reduced Muiredach’s forces to a handful of tired, broken men. Though his forces were equally spent, now with only 300 or so to return to the siege of Desmond, Duke Murchad finally let the fleeing men of Desmond escape into central Ireland. He turned back to join up with his forces to the south and complete the siege, the realization of his plan so very near. That was when it all fell apart. For reasons that the duke would never fully understand, the northern lords of Ulster, who possibly saw the southern unification efforts as a threat and a sign that someday Munster meant to move north, reached out to the Pope and begged the Vatican’s support in denouncing Murchad. While his own relationship with the center of Catholicism in the civilized world had never been exceptional, it also had never been strained. But the influence of the strongly Catholic north of Ireland was considerable. Murchad was quite surprised, therefore, to find himself suddenly excommunicated. That, however, was only the first element of the trap, and the surprise of word from the Vatican would compare not at all with the surprise that awaited him when he discovered that the powerful Scottish king had long been waging war against those who fell out of favor with the church. And even as the siege of Desmond, which was not going well, seemed prepared to go on through the winter, Murchad found himself in an entirely unexpected war with Scotland. The northern lords of Ulster, Tyrone and Oriel made way for the Scottish army which pushed through Ireland with an organized force of more than 6,000 men. With word of the devastating force moving through the counties in the name of the papacy, Murchad had no choice but to pull back with his 500 remaining men to County Thomond and his seat of power, such as it had become, and wait for the inevitable. The siege did not last long, and the forces of Munster fell quickly. Though the Scots did not imprison the duke, they did strip him of power. This was not a war of conquest and land acquisition, as much as it was of removing a single threat from power, much as Murchad himself had hoped to do in his own Duchy. The Scots allowed the duke’s son, Brian, who was still recognized as legitimate by the church, likely due in part to his marriage within the English royal family, to take power in Munster, though he was no longer a duke, and under the agreement Desmond was returned to the duchy and its once embattled Earl permitted to retain his southern titles. The once liege was permitted to remain in court, though he was not allowed to hold titles or land, and he watched helplessly as his son took power of a realm far weaker and more vulnerable than his worst dreams. Within the next 5 years, Murchad died of natural causes, a failure. His father dead, Brian sat on the unfamiliar throne and brooded. His attention, however, was not on the south, as the Earl of Desmond had committed himself to this new peace and seemed to pose no threat. No, Brian’s eyes gazed north toward the traitorous Catholics of Northern Ireland who had betrayed his father, and toward the Vatican that had forsaken his family and allowed outsiders from Scotland to disgrace his father. As he sat, he knew that the south of Ireland would not forget what the north had done, and made a private pledge to see that he and his heirs make the north pay for its treachery, even if it took a thousand years. Makes me want to play in the Isles.. I always chose one of the ever fractious Italian city-states for a start because of the central location. Great article though, thanks for sharing and creating a very personable narrative. Damn fantastic read. I would love to play a great emergent brooding sim like CK2, but my computer is 200 videos short of the minimum 9600. Ah, good old Duke Murchad of Munster. In my first CK2 game, Murchaud met his untimely demise when his hand-picked, but overly ambitious daughter-in-law pushed him off a balcony. 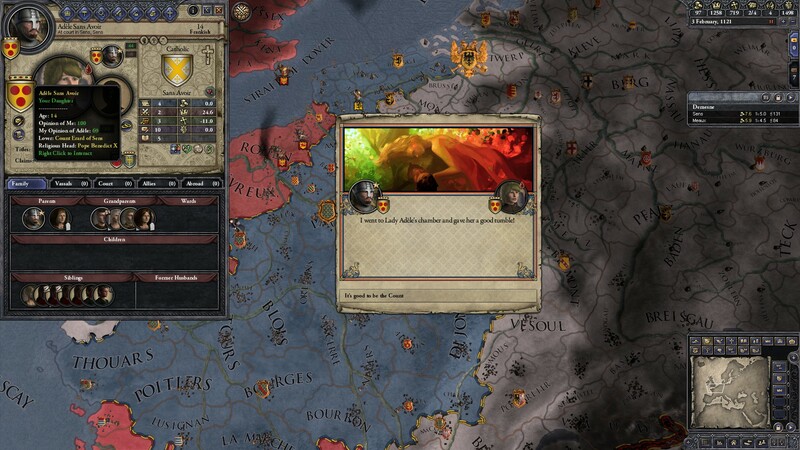 The stories CK2 generates all by itself are pretty awesome. I also prefer to start somewhere a bit isolated, I got familiar with the game playing in Ireland and had my greatest success in Sweden. Very nice, Sean, thank you for it! The best thing about CK2 is the stories it makes. First you get the power, then you get the money, then you get excommunicated. Like most Paradox stuff it took me a while to wrap my head around everything that was going on, but once I did it was fantastic! I have yet to get more than four generations in without getting wiped out by a Jihad or assassinated by a rival. Don't forget to pick up the Game of Thrones mod for CK2! It's still a work in progress, but GAME OF THRONES! I want to love this game. And I might. But holy hell, as a newb to the PC gaming scene, the demo is baffling. To be fair, that's more than likely a problem of poor demo design, but it certainly scared me off a little bit. I'm waiting for an opportunity to get into it, when I have an enforced few weeks on the couch. Here's hoping for some kind of illness! The tutorial in the game is just not very good, what I did was watch few tutorials on youtube first that got me started with basics and then I figured out the rest on my own. The effort was very much worth it. This is the guide that I watched: Crusader Kings for Newbies. I got to about part 5 or so and felt like I had the hang of it and have been OK. I should probably start watching from where I left off to see if I've been missing some things. For Wales! Long live King Downs! I don't like to use super detailed guides. Exploring and failing is part of the fun. I did use this though and it helped greatly. Why did you do this to me? Now I have to pick CK2 out of the pile and actually learn how to play it this time. Damn you. My heirs shall haunt your family. Just picked up this game in the last Steam Sale. Like you said in the podcast, they do toss you in the deep end of the pool. and the CK2 Wiki, I'm just starting to get a small inkling of what is going on and I'm now drinking the Paradox Interactive Kool-Aid. Should I move on to "EU-4" next? If so, I don't know if I'll ever seen my family again. Like to stick around and talk some more, but it's Saturday and I need my gaming fix. P.S. Want to thank the Gamers with Jobs family for being so welcoming. If anyone has any questions about the game or just want to share some CK2 stories, come on over to the CK2 thread. Lots and lots of good stories and advice to be had there. Crap, I'm a PC gaming veteran and this is the first game I've sat down to try out a game and within 3 hours I had yet to make a single move, let alone establish any comprehension of WHY I should make a move. I've watched a couple of let's play's and I'm still unsure about 75% of it. Sadly, I tried just going with it, but just didn't have any fun. It's still haunting me though because I know from my Civ and Warlock addictions that I'm probably doing myself a favor not getting it. The Europa Universalis games are, by my estimation, vastly more straightforward, and the dynamics in play are far more traditional for a strategy game.